Utforska medeltida historia i Moldavien på denna privata 5-timmars Orheiul Vechi och Curchi Monastery turné. Resa med luftkonditionerade minivan till Orheiul Vechis antika klosterplats - allmänt betraktat bland Moldaviens viktigaste arkeologiska och religiösa platser. Utforska det öppna komplexet av grottor, befästningar och ruiner med en privat guide och få insikt i regionens rika medeltida historia. Änna en fantastisk utsikt över floden Răut och det hårda landskapet bortom, besök det 1300-taliga grottkloverket och lär dig om den lokala livsstilen i en traditionell moldavisk by. This ended up being a private tour. My guide picked me up in his car which was very comfortable/new and we proceeded for the day. We spent time at Old Orheiul, which is an old cave church with views out over the river. The church, despite being inside a cave, has beautiful orthodox iconography, and candles burning everywhere, as it is an active religious site for the Russian orthodox community. 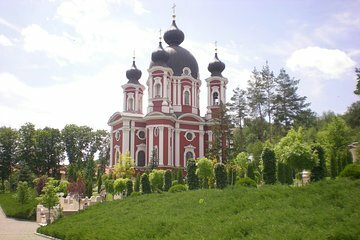 There is, up the hill from the cave church, another orthodox church, which you can visit as well, and one where regular services are now performed. Be sure to dress modestly as the orthodox community is just that: orthodox. We also ate some local cuisine in the little village down from the cave complex which was delicious and inexpensive to boot. There are a number of restaurants in the little village, so no shortage of choice. Afterward, we went to the Curchi monastery complex where there are multiple orthodox churches on the grounds. They are all very impressive, and the setting is like an idyllic country postcard scene. I definitely enjoyed seeing both the historic sites and the orthodox monastery, which would've been difficult to visit on my own. I think it well worth it.